This hand-crocheted cotton blend veil with woven cloth ears for riding and turnout is designed to reduce the amount of face flies and ear gnats on your horse's face. Note: The colors available are basic and color swatches are not available. Yes this is out of my comfort area but gives my trail horse peace in the summer. I just make sure there are no large mirrors on the trail!!! I bought this for fly season, my horse has a really thin and short forelock and seems more comfortable on rides in fly season with it on. Has made an amazing difference in my mates additude! Very nicely made, but very large! I am hoping to shrin it w a hot wash. They were fabulous and the price was stupendous! We used them on 6 Connemara ponies performing in a dressage quadrille and they added a very classy look. I would buy again anytime. Very well made! Would buy again! They were cute and she looked good in the July 4th parade, BUT, she hated them. Shook her head constantly! Probably dependent on the horse. She loves her fly mask in the pasture. It may have been that the crochet yarn was too hot in this Texas heat. It would be nicer if it had loops to attach to the halter/bridle instead of the flimsy bit of yarn that goes around the throat latch. It was easy for her to shake the deal sideways. But...very cute and inexpensive decoration. I have a green one and may get a blue one for parades...not for daily use with this particular mare however. We ordered 2 of these, they slightly varied in size, so I had to fix the one that was a bit big. Looks really good though. I ordered the white one for my 14.3 h Arabian. He is not show-bred so his head is regular horse size. The veil is perfect size, coming down to just above his eyes. Yarn and fabric are good quality cotton, however, the ear holes are too small in diameter and the distance between the ears is too short. I will save it for my 11 h pony, but need to buy a different brand for my horse. Recommend only if you have pony. Nice quality, just like any other fly veil I've gotten in the past. Great price! Fits my horse perfect! I ordered two of these to match my mare's saddle pads. The purple one was the perfect color, and it fit my quarter horse mare perfectly. I love it and I use it whenever there are flies. I also ordered the pink one, but it seems to run larger, especially in the ears. I might have to trim some of the tassels so that they don't hang so low on her face, but I don't have that issue with the purple one. It also is a soft pink color, which is fine for me, but it doesn't perfectly match the raspberry saddle pad that I have. I expected this, but being able to see the colors online would be nice. My horse has two blue eyes so this shade of blue is perfect. It is a nice design and will be great for keeping flies off his ears and forehead. I dont' put around the neck as it has to be tight...I put the loop on one side thru the bridle and then tie and wrap the long string around the other side of the bridle...keeps off his neck! I bought six (cheaper price) because I had seen them on other trail riding horses. They are cute and seem to really help with the flies. You need to tie them on fairly tight because if the horse shakes his head they can pop off.They fit my horses heads differently-- on our saddlebred the fly veil fit perfectly. I have a quarter horse and it was a little tight but stretched enough to work. They will not work on our percheron and our thoroughbred tolerated it but it was tight. Our paint wore it perfectly!These veils do stretch so they will likely fit most horses!We are traveling across the state this weekend and I am going to really put them through their paces! This is basic and totally fine. Just fits a horse who normally wears 'horse' size halters. . Had to smooch down the ears a bit. I'd say a little small but still fit. Only thing I didn't expect, as this is my first one, is that it ties on under the throat latch by a small string right side and loop on left side. Not sure I love that but I don't really tie it and just loosely have it on so in case of an accident it doesn't strangle him. I use the bridle to keep it on. I also loosened the bridle one hole to account for the extra bull on his poll. We purchased 4 of these in effort to protect ears of our 4-legged pals while out in pasture. Sadly, they do not stay in place- no matter how snugly they are secured with the throat latch tie. A horse roll/shakes/scratches/etc.- off they come. They may work just fine when under saddle if used in that manner to protect ears while riding. I bought one and think it is beautiful. It works quite well, if you clean the flies out of ponies ears FIRST! I would recommend this product even though it is a tad over priced. The green one is the best!!!! Beautiful, soft and vibrantly colored! I just wish they showed the color swatches because I wanted a particular shade of pink and purple so I just bought them and held my breath. I was very happy with my purchase! I bought 3 different colors and I love them all! I tried the fly veil last weekend, fits my 15.2 hand MFT mare just fine. Bugs weren't that bad last weekend, but I can see how this will definitely keep the bugs off my mares ears and out of her eyes. I just got this a few days ago. One of my barn friends had one and she said it really works. I tried it out today and my horse was comfotable with it. The only bad thing I had to say it that the end of the tie-off string was unraveling but easy fix was to tie a knot. And not to mention it gorgeously matched her rope halter that I ride with! Thanks Stateline!!! a friend let me use one of hers it was great! Fit my big eared paint! I was looking for a fly bonnet that would actually fit my big eared Paint! This one fits him great! I ordered the pink, it is very light and pastel color. I like how when he canters the fly bonnet's front area doesn't flap around. He looks so cute dressed up. The fly veil sure does look good. Always said if he looks good he will make me look good too. Very economical fly veil. Fit face good however ear pieces are little big. But that is ok still keeps flys off. I bought two of the large and it didn't fit my Paint stallion. My stallion has small ears and a very nice head, however the largeCrochet Fringe Fly Veil was too small. It was way above his eyes and too narrow. I used the fly bonnet for a horse drill team and added some faux jewels on it and it looked great. I plan n doing the same for parades and Christmas light parade. I got lots of compliments on the costume the imagination is the limit. I love this product I use it every day when I ride!!! I definitely recommend it! 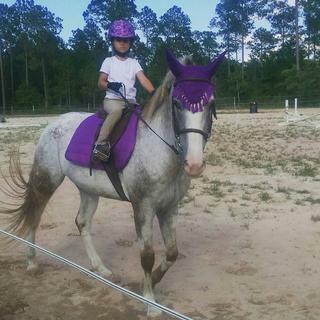 Great price, great fit, cool colors and the horses look sooo snazzy! I bought this in red for my tb mare the ears were too small even though my mare has averag sized ears. After three rides the ear was already tearing apart from the crochet part the tip of the ear is also has a large hole in it along the seam. But the price is good for what you get. I ended up purchasing another in white and that one fits great and is showing no wear whatsoever! The white one stays surprisingly clean too! So overall this product Definetly has a lot of pros and cons but the price is unbeatable so for just schooling I would say it's good but not nice enough for show. Nice! Well made isn't junky like I thought it would be. I cut off the string because that was annoying me, so I just use the thought latch through the loop to hold it on and the bridle holds it on. We'll put together a super cute! This ear net surprised me with the quality of the materials! Very excited to put it on my horse. Bought this for my Morgan/TB cross. He looks very smart in it and keeps the flies at bay! Helps decrease my horses distraction from flies while riding. Would not recommend it for use in stall or turnout in field. Good, effective, though tie was on the right side. Fits all the horses I have put it on (15-16hh) easily. Holds up well. However, like another poster said, I did not notice until I went to use it for the first time, that the tie was on the right side instead of the left. Inconvenient. Out of 30 days, no exchanges. I had one of these for my horse & it's fun & functional to keep pesky bugs out of the ears on trail rides. I only use it when the nats & no-see-ums are flying. Sometimes I use it just for fun. I recently bought 6 more to give away as gifts. Perfectly priced for stocking stuffers! Fun colors too. Bought the white one, looks great and fits my 17hh warmblood mare pretty well. Super cheap, but the quality is as expected (not the best, but not the worst) for the price....it ties on the wrong side but that's okay just for schooling. Will probably buy more in the future! my horse is 14 hh mare, i have to cut the tassles near her eyes so they dont get irritated. but otherwise its really cute, esp the pink! everyone asks where i got them? Love these for my horses. Really help with fly control during trail rides. Great color options too! Looks nice, fits well. Ties on the wrong side but for the price I can deal with it. I bought this to use trail riding and it works really well. I did have to rip the ears off because they are not big enough to fit the average horse, but they tore off easily and didn't rip the rest of the veil. I really like this and it works very good. My Mare, Sierra, loves her ear net! Whenever we ride she always got attacked on her poll and around her eyes from the flies. It was very hard on her and was distracting to me to have to keep shoo-ing away flies. Now that I bought this, the fringe shoos away flies with out bothering the horse and it looks very pro! Love these! I wanted a brown fly veil to go with my western tack. My horse is sensitive to flies in his ears and it distracts him when we ride. Hoping this equals a less stress free work out and trail ride. all my daughter wanted for her birthday is stuff for her horse. Never used this type of ear protection without the face mask, so wanted to see how it worked ~ great price helped! I am hoping it is as pretty as it looks useful. My daughter was looking at these fly masks at Dover Saddlery and thought that her mare would like these better than the standard fly mask. good to have on hand for a ride. Always use when on trails, it makes a very big difference and my horse acts much better! These are nice to have around. It keeps bugs off their sensitive ears and it adds a dressy touch to riding. Loved the color options and the price was amazing! The last one I had wore out after many years. Needed a replacement - good price. My horses love them when we ride! Gift for friend, purchased previously for customer and they were impressed. Looks fancy, keeps horses happy ! I saw a friend with one of these, and she recommended it, so I thought I would try it. Haven't used it on my horse yet, am hoping when I do use it, my horse will like it as well for keeping bugs out of her ears! I've used this fly veil before with good results. Helps decrease my horse's distraction with flies bothering him while I ride. My old one gave me many years of use, but I've misplaced it. This one is to replace the one I've lost. I use these for trail riding. Keeps the pesty bugs away. I ordered a couple of extra for others I ride with occassionally to use. Because when my horse wears fly masks he manaages to rub all the hair off around his eyes. Thought this might be a better choice. I have a red one and a black one of these. Just thought white would be fitting for summer. Flies bother horses ears when riding in the summer. I was looking for a cheap bonnet for a costume. I had good reviews, and I read that it will fit a pony/cob. So I hope it will fit. I am very excited to try this out. The flies are driving my horse nuts. My mare will look really nice in this fly veil, so looks plus coverage. Fly's are bad in the south. Rode with one of these fly bonnets and it was great and looked cute on my appaloosa mare but I lost it, so am buying another, it s essential in the summer here. We do a lot of trail riding...this looks great on my Arabian and keeps his mind off flies. I purchased one of these in the past and I liked the way it protected the ears and eyes from flies and gnats. It also learned that it seems to help on really windy days when horses tend to be on high alert. This seemed to tone that down a bit. It's a good priced and looks very cute! Have used one for several years and doesn"t irritate my horses like a full face face mask. I like the color and the design. I feel like the colors will look great on my horse. We are doing a drill team presentation and need a different look for our horses. I am going to add some bling to the fly bonnet. The price was right for the costume. What kind of green, blue, pink? Dark, light, pastel, bright? BEST ANSWER: I bought a white one, so I could just throw it in the wash and bleach it back to white when it gets dirty. BTW the horse I use it on is white, so from a distance, it's almost invisible. He's very happy wearing it. I have two..white and dark green. I love both of them..only thing I wish is that there was a better way to attach. Dark green is a really nice dark green. I have this in purple..I know that isn't one of the choices you are asking about, but the purple is a deep dark color. Very pretty. I have a red one. It's a little faded after a number of washings, but is still a medium-dark color. I have brown, works great, does not show dirt comfortable for the horse.. I have red, pink, and green.. They are great. They are dark colors. The color is a darker shade. Can you cut off the tassels without ruining the rest of the fly veil? BEST ANSWER: Yes you can. I hate the look of the tassels...looks to "cartoony"
The whole point of the tassels is to bounce around and keep the flies off, I would not cut them off if you wanted the veil to do it's job. Yes. But the tassels don't bother any of my horses and bounce around keeping bugs off. I want to say (if I recall correctly) the tassels attach into the crocheting - so no. No, it seems to be all one piece, and may unravel. Doesn't look like it but I don't know for sure. is there a way to view the colour? it only gives you a list to choose from like if i wanted to order blue fly net is there a way to see that colour of blue? BEST ANSWER: Thank you for pointing that out. We have put in a request with the Manufacturer to provide stock photos of all available colors. When that is done, they will show "live" on the site. I have the black one. It works great to decrease fly distractions while riding. I spray a little fly repellent on the ear section only to further decrease the fly bite. My GUESS would be that the blue would be a bright blue like most other horse products. These are so inexpensive, why not buy the blue and a safer colour (black) at the same time? These are a popular item and stock rotates out quickly, so we purchase them from several different sources. Because we do not always get these from the same supplier the shade of each color will vary. Each one is considered a "basic" color, however, which means no extremes of light or dark shades. The veil doesn't change colors on the ad page when you click on color of choice, as far as I know. However I ordered a purple one and it is a nice deep purple, not black looking, true purple. what shade of blue is it? BEST ANSWER: Kind of a royal blue. I am sorry I cannot help. I bought green and white Crochet fringe fly veil. BEST ANSWER: Across the back is 11 inches from side to side. From bottom of back to center (between ears) is 5". Ear covers are 6 " to tips. From between ears to TOP of fringe at front is 8". The string to fasten veil (behind ear area) is 32". There is a loop on the opposite side to attach the string. Might be large for mini, but fits my gelding of 15 hands. Hope this helps. I bought 2, one was just right, between the ears is about 5 inches, and everything else was correctly sized, the other one I purchased at the same time was MAYBE 3.5 inches between the ears and the veil part didn't even go past the browband. Surprised me about the size difference between the two. I use these on my Rocky Mountain horses and Morgans. They have cob size heads. One size fits all. It just ties around the neck. the ride rather that shooing insects away. I have it in brown. It works pretty well but it is kind of tricky to keep on. I think if it is put under the bridle it will work. I have one and it's absolute purple. and in the medium color range, not dark nor light. Yes, it is very pretty. Will this fit a 14 hand pony? BEST ANSWER: It should. I have tried to use them in the past, neither one of my horses cared for it. I have used it on my daughter's 14 hh Arabian, so I would say it probably should. Very durable. Been using mine for two years. I put it on under the headstall. They absorb sweat so I rinse it off and wash it regularly. I haven't had any issue - all I do is trail ride had it for 2 yrs still good - washes nicely. Is the pink light pink or raspberry pink? BEST ANSWER: The pink I got was a very light pastel pink. So far from the differing answers it seems like a crapshoot. Is the green a lime green? BEST ANSWER: I like the fly veil and use it trail riding. does this come in draft size? BEST ANSWER: I purchased the fly mask for 4 horses; all fit fine. The largest pony is 15 hands. However, none are drafts!